Villa Trou aux Biches is a luxurious eco friendly Resort and Spa located right at the stunning white sand beach in the north of Mauritius. The resort enjoys amazing sea and sunset views enchanting its guests every day again during their stay. Trou aux Biches houses 17 three-bedroom private pool villas, perfect for families and groups of friends seeking for a tropical hideaway on this charming island. The master bedrooms feature large king-size beds for a good night sleep and in the morning, guests get to wake up to the view of the garden when sliding open the black-out curtains and glass sliding doors. Modern amenities are also provided. There is air-conditioning, TV and a safety box found in the wardrobe closet. The en-suites are utterly tropical, boasting outdoor showers and deep bathtubs to soak, shaded by a gazebo. Each three bedroom villa in Trou Aux Biches Resort and Spa houses two more bedrooms, one fitted with a king-size bed and the other with twins for the kids. Both rooms feature AC, television sets and private en-suite bathrooms with rain-showers. The peaceful tropical gardens are bordered by the white sandy beach and the azure blue ocean. In and around the gardens grow tropical high swaying palm trees and each villa has its own private swimming pool encompassed by a timber deck with sun-loungers. The villas also feature BBQ and outdoor dining areas for enjoying meals alfresco style beneath the stars. 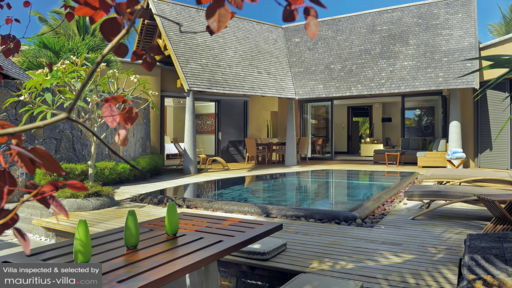 The living spaces are tucked in tropical open-plan pavilions, overlooking the garden and pool. The lay-out focusses on space and privacy and the living rooms are furnished with everything a comfortable home away from home needs. There are sofas to curl up on reading books or watching movies, there are indoor and outdoor dining possibilities and the kitchen comes with a Nespresso machine for delicious coffee at any time of the day. Professionally trained staff is at your service for the whole duration of your stay. There is butler service from 08.00 to 14.00, daily housekeeping and 24 hour security. For families travelling with youngsters, a baby-cot, high chair and pool-fence are available. The resort has a kids and teen club on-site as well as a pampering spa and watersport activities. High-end dining is also possible within the resort. There is a wide choice of excellent restaurants to choose from. Villa Trou aux Biches is found on the northern side of Mauritius and it certainly is one of the most beautiful beaches of the island with azure waters and a white powdery beach. Within the Resort itself, there is full entertainment for young and old, from pampering spas to watersport activities and snorkel trips. Guests can also explore the surroundings themselves. The popular town of Grand Baie is just perfect for a wonderful day out, strolling along the bazaar, shopping and dining at beach-front restaurants. To sniff up some culture guests can visit the islands capital Port Louis, just a short 35 minute drive away. To reach the international airport of Mauritius takes around 1,5 hour. A big thanks to Fatima Chuttoo, to Anwar and his team at l'Oasis and to Conchita as well as to the rest of the team at Trou aux Biches for the warm welcome and for making our stay extra special. The Mauritian night was so beautifully organised. We really enjoyed the food, the views, the spacious rooms, the heated pools. The service was excellent. Thanks to you all. Till next time! Great beach; great food and very friendly staff. The restaurants offer a great variety of cuisines. The beach is clean and exclusive and the pools are great. I also tried the spa and the treatments were great. AMAZING OUTDOOR SHOWER, need a say more? I could not have dreamed of a better place to stay for my honeymoon and it was worth every cent. From the moment we entered, we felt welcomed and immediately relaxed with beautiful views from the reception. We were always greeted and assisted by friendly and helpful staff. The rooms were incredible, the beaches were stunning and all facilities were better than I could have asked for. The watersports were all inclusive with amazing snorkeling. There's something to do for everyone. I highly recommend this to everyone.